R. Albert Mohler Jr. presents Thom Rainer with the E.Y. 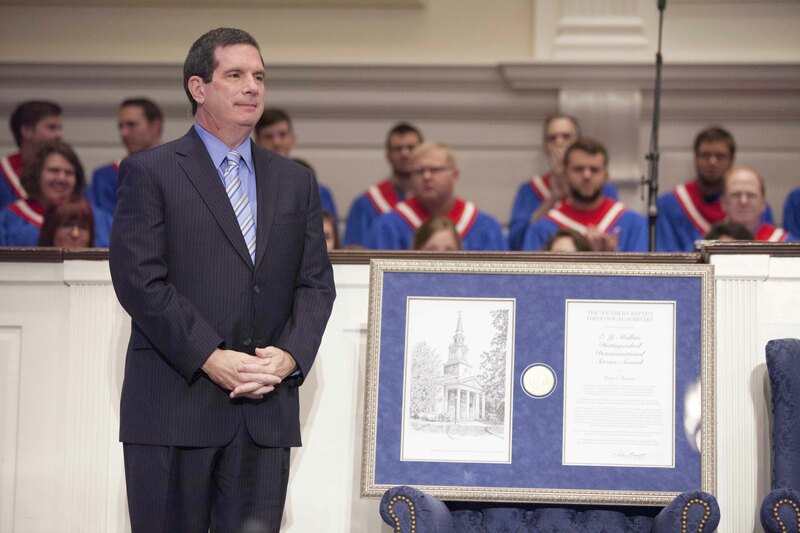 Mullins Distinguished Denominational Service Award in Alumni Memorial Chapel, Oct. 14. Trustees of The Southern Baptist Theological Seminary celebrated the 20th anniversary of the Billy Graham School of Missions, Evangelism and Ministry during the fall trustee meeting, Oct. 13-14. During an Oct. 14 special chapel service marking the occasion, Thom Rainer, the founding dean of the Billy Graham School, preached a sermon on evangelism and President R. Albert Mohler Jr. read a congratulatory letter from the Graham family. Mohler read the letter from Will Graham, grandson of Billy Graham and vice president of the Billy Graham Evangelistic Association, who sent greetings from the Graham family on the occasion of the BGS anniversary. The nearly 96-year-old world-renowned evangelist is “homebound, frail and weak, but confident in heart about the promises of eternity and the truth of the gospel of our Lord Jesus Christ,” his grandson wrote. Will Graham noted that his grandfather was reluctant to grant his name’s use for the seminary’s new graduate school, “Not because he was reticent about the vision and promise of the school, but he was cognizant of his own inadequacies and purposed then to be certain that God would be glorified and that the gospel would be the main focus of the school. That has been more than realized through these twenty years” lived through the lives of BGS alumni. He added, “Beyond my grandfather’s trust in the originating vision and purpose of the school, there was another reason for his willingness to lend his name to Southern — and that was you,” addressing Mohler. Thom Rainer, president and CEO of LifeWay Christian Resources, served as the founding dean of the Billy Graham School, 1994-2005. Before he spoke, Rainer received the E.Y. Mullins Distinguished Denominational Service Award, one of the seminary’s highest honors, Mohler said in presenting the award. 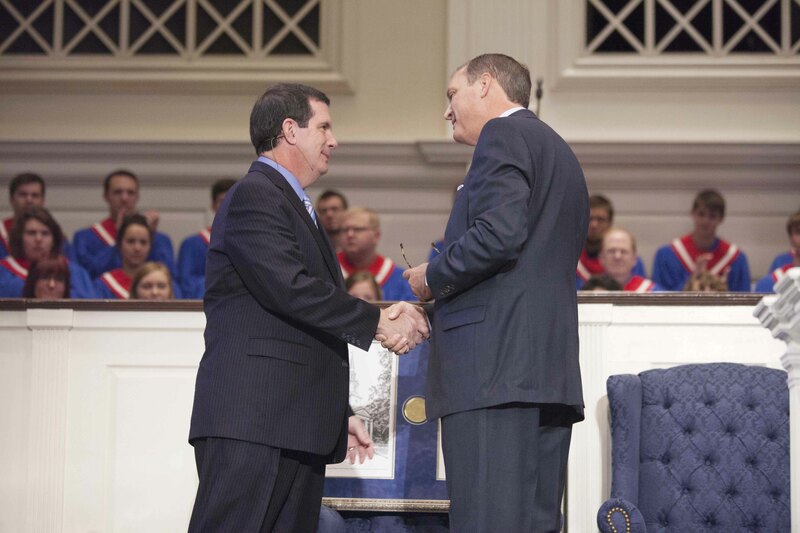 Rainer was recognized for his “remarkable legacy of leadership” as pastor, scholar, teacher, and founding dean of the Billy Graham School, as well as for his role as author, speaker, and president of LifeWay Christian Resources of the Southern Baptist Convention. Rainer, who served as BGS dean, 1994-2005, preached a sermon, “We Are Unable to Stop Speaking,” on the imperative of evangelism from Acts 4:13-22. Rainer preached from the account of Peter and John before the council after healing a lame man. When the council charged Peter and John to stop witnessing to people, they refused and said, “Whether it is right in the sight of God to listen to you rather than to God, you must judge, for we cannot but speak of what we have seen and heard” (Acts 4:19-20). Rainer presented four truths in the passage which lead to bold evangelism. The power of the gospel is sufficient for evangelism, he said, noting evangelism is not a program, but is gospel power. “Evangelism, in its purest sense, is the overflow of Christ who is in us, coming through and sharing his gospel with others,” he said. Second, Christians who evangelize will always face persecution, no matter their country or vocation. Third, right theology leads to evangelism. Finally, gospel-powered evangelism cannot help but speak. Mohler noted it was appropriate that the day the seminary marked the Billy Graham School anniversary was also “Engage24,” a movement by college students to encourage Christians to share their faith. 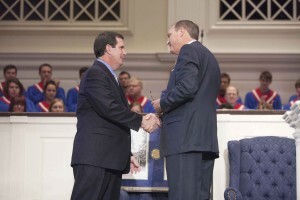 Mohler encouraged the seminary community to participate, and students received copies of “Experiencing God’s Grace,” an evangelistic tract published by the Billy Graham School. The seminary also marked the BGS anniversary during a reception in which a portrait of Graham was unveiled. The portrait by Aileen Ortlip Shea, sister-in-law of longtime Graham associate George Beverly Shea, is a replica of the one that was presented in 1962 at the dedication of the Billy Graham Room in the seminary’s James P. Boyce Centennial Library. The portrait will be permanently displayed in Cooke Hall, the home of the BGS. A special edition of Southern Seminary Magazine marks the BGS anniversary, featuring Q&As with Mohler and Greenway; articles by Rainer and Southern Seminary librarian/historian C. Berry Driver Jr.; a brief history of the school; a survey of 20 BGS alumni; and an essay by Billy Graham adapted from his 1993 address during Mohler’s inauguration as Southern’s ninth president. The founding of the school, which Mohler announced at his inauguration, was “powerfully symbolic” to have the only graduate school named for the famed evangelist, he told Southern Seminary Magazine. Additionally, the Billy Graham School became a strategic means of returning the seminary to its confessional, conservative identity, he said.